I know it’s only August but I like working on my Halloween cards as early as possible as I make quite a few of them to send to friends. 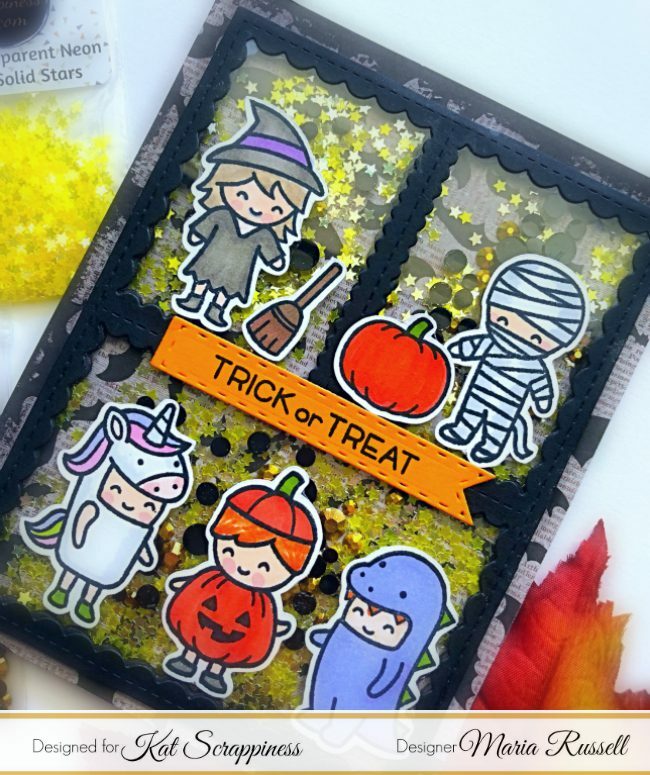 For my card today I am showcasing the Stitched Scalloped Collage Frame Die, the Lawn Fawn Halloween set and the new Gold Jewels mix and 3mm Transparent Neon yellow Solid Star Confetti mix. I started out by stamping my images on Neenah solar white card stock and colored them in with my alcohol markers. Since I don’t have the coordinating dies for my images I used my Brother Scan N Cut 2 to die-cut them. I also die-cut the Stitched Scalloped Collage Frame die with some black card stock and used my foam adhesive to create my little well for my shaker card. 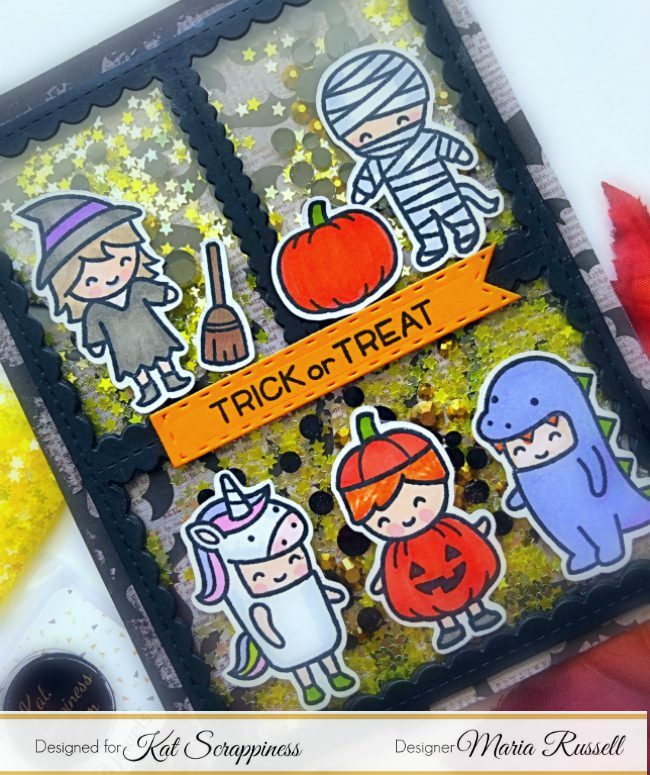 I assembled my shaker card and stamped my sentiment on some orange card stock using the banner die that is included in the Crafter’s Essentials 1 die set. This die-set is probably one of my all-time favorite dies to use for my projects. I didn’t use the traditional orange and black sequins because I felt that it would have overwhelmed the whole card design. 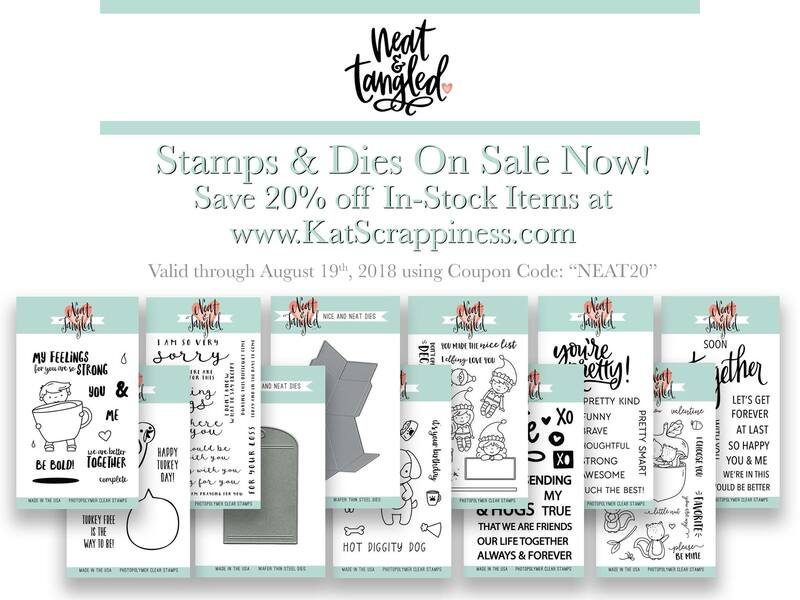 Before I end this post, I wanted to let you guys know that Kat Scrappiness is having a 20% off sale on all Neat & Tangled products, using coupon code “NEAT20” and this is only valid until August 19, 2018. I hope you guys got inspired today. Please use my coupon code “MARIA10” for 10% off your order. Remember, you cannot combine this coupon code with other sales in the shop. Thank you for stopping by and have a wonderful day! Happy crafting!